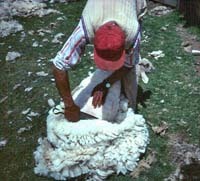 Sheep are farmed both on the mountain Base and the lowland plain. 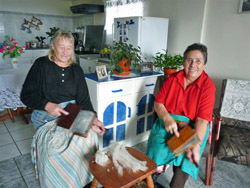 Their wool is hand spun for knitting. Stuffed roast mutton is Tristan's favourite Christmas dish. 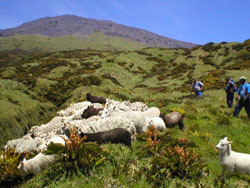 Tristan's steep mountain slopes are ideal for sheep who thrive particularly on the lush pastures of The Base of the mountain. 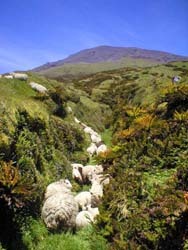 There are over 600 Tristan mountain sheep on Tristan, managed by teams of Islanders known as 'gangs' who first laboriously lead their stock up one of three paths or 'roads' up the sheer cliffs to the plateau lower mountain slopes known as The Base. The Big Green Hill Sheep Gang are pictured left near the end of their trek from the Settlement taking a sheep to join their growing flock. Sheep are gathered (right) in narrow valleys known as 'gutters' to be shorn, marked or slaughtered. Mountain sheep are prized for their flavour for a Tristan Stuffed Roast Mutton Christmas feast. Around 1000 sheep graze the Settlement and Patches Plain. 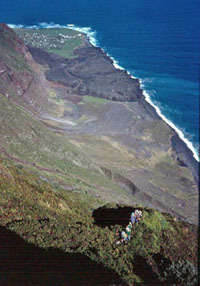 The 1961 lava flow(left) now has some suitable grazing and in the future will be covered with vegetation as the rock weathers and forms suitable soil. Sheep stock is limited to seven per household, or three for a single householder to conserve scarce grazing, but sheep are far more efficient grazers on the windswept plains than cattle as they are able to nibble short grass and are sure-footed on the sheer slopes. 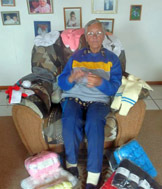 is normally held annually at the beginning of the fortnight's Christmas and New Year Holiday. 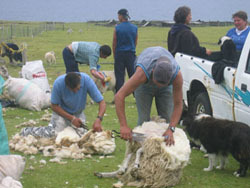 It is an event for the entire island community when every family gathers their sheep into the communal pens (left) before hand-shearing their own sheep (right). 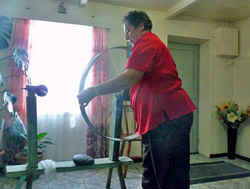 Another skill expected of every Tristan man, but only practiced once or twice a year.